I started with sponging the chunky chevron stencil to give a soft and gradient effect. I then inked and stamped a text stamp randomly, while the stencil was still on my paper. I then stamped the poppy stamp onto a watercolor paper. Colored in a bit, keeping the colors soft and attached it to the card using some tissue paper and thread. To finish, I just added a bit of sparkle using the Tsukineko Shimmer Spritz to the flower. For my 2nd. card, I kept almost the same layout. I used the mini burst stencil. I applied some white embossing paste to which, I added a bit of StazOn re-inker. Now this re-inker won't mix in fully and thus giving a beautiful shaded effect. Once this was dry, I cut some flowers using the pattern papers, inked the edges before assembling it. I diecut some leaves out of vellum. Finished the card with a sentiment banner and some thread. They are both beautifully executed cards. I may have to CASE them :) Thanks for the inspiration. Thanks for sharing your wonderful designs. 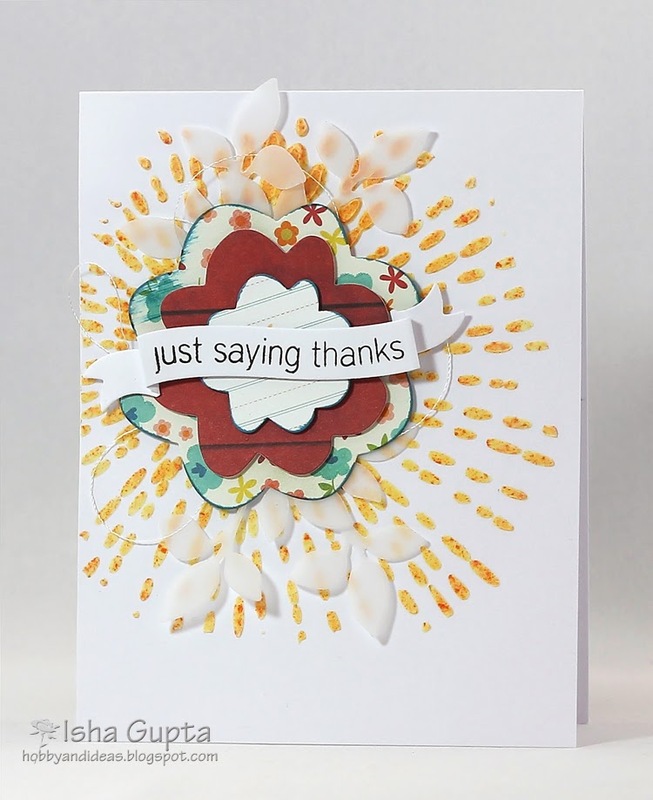 I love the two card you created and will try that stamping through the stencil. It's so funny how we never think of the obvious, but you did. Gorgeous! 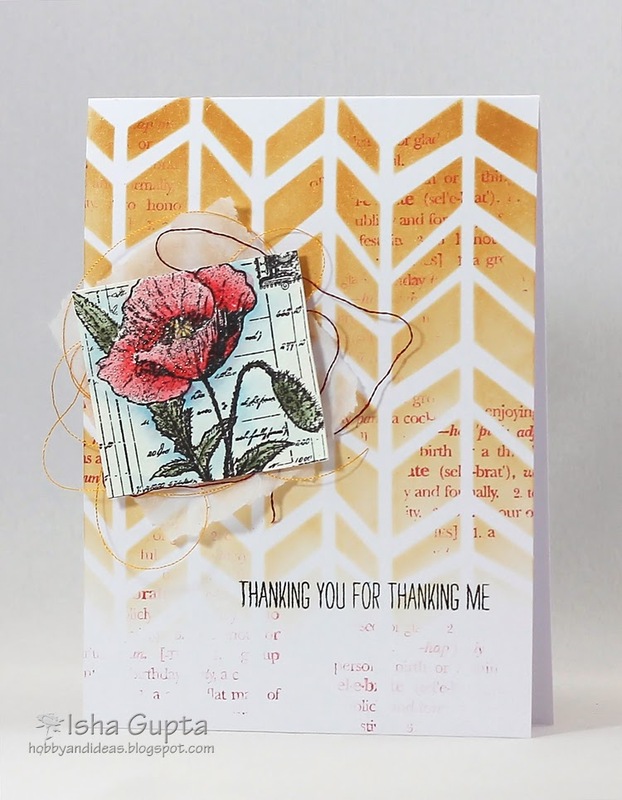 I really like the soft look of the stenciled background with the detail of the stamps you used. Best of luck in the future! Beautiful. Absolutely love the gradient effect and of course all that white space. Really makes the stencils and color pop. Gorgeous. Beautiful! Love the stamping with the stenciling and the layers are so pretty! The techniques on your cards are phenomenal! LOVE your style...those cards are pure joy. Isha both your cards are fabolous. Love them both. You made an awesome job. Love the effect when you use vellum. Thank you Isha for your all your inspiration this month. Today's cards are wonderful too. I really do need to try some stencils on cards. BOTH cards are so STRIKING! LOVE the gradient colors and the pops of red! THX for inspiring me!